We live in a Jewish community which aspires to ethical leadership, and yet our communal structures and actions are often found wanting. This is evidenced by persistent inequities around gender, race and class as well as by recurring scandal and misuse of power. The #metoo movement has recently increased awareness of this problem as it relates to the sexual violence and discrimination faced by women in the workplace and beyond. These gaps between our values and our lived experience pose grave challenges to the moral integrity of our community. This reality demands new ways of acting and thinking. Created Equal: Men, Women and the Ethics of Shared Leadership is a research project which seeks to address these gaps by considering how Jewish ideas and experience can inform our struggle to pursue the ethical. What examples in Jewish thought and experience can help us consider the tensions involved in trying to actualize our values more consistently? Our foundational assertion is that it is crucial for Jewish organizations and leaders to ask how Jewish wisdom should contribute to our thinking about how we craft our communal environment. Created Equal places gender inequity at the center of this discussion: the power imbalance between men and women in our community serves as the lens for this project’s discussion about power, ethics and change more generally. Many of the root causes of gender inequity in our community – e.g., narrow images of leadership, the relationship between change and loss, the dynamics of power and privilege maintained by both Jewish tradition and Western society – are relevant to what needs repair in our Jewish ecosystem more generally. In November 2017, 30 leading theorists and practitioners convened for a day of thoughtful discussion on topics of power and privilege. The group,comprising academics, rabbis, Jewish communal leaders, philanthropists, activists and educators, explored crucial questions of how gender, class, and race impact the distribution of authority and influence in Jewish communal life. Learn more. Joshua Ladon taught a session entitled To See and Be Seen: Diversity, Inclusion and Community in Jewish Day Schools, at the inaugural Prizmah Jewish Day School Conference, February 5-7, 2017, in Chicago. Learn more. Ethics, Leadership and the Jewish Future: Bridging the Gap Between Jewish Values and How Leadership is Exercised in American Jewish Life, a daylong community-wide conference held in New York City in May 2016 included key stakeholders and change agents in the North American Jewish community. The conference explored the ethical, strategic, and moral imperative to work toward a Jewish community based on shared leadership. Learn more. 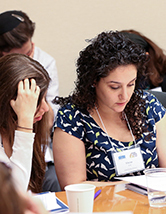 In September 2016, a diverse group of Jewish educators from across North America and across the Jewish communal landscape came together for a two-day training seminar at the Shalom Hartman Institute of North America in New York. During the training seminar, several members of the Created Equal research team modeled the curriculum, providing the educators the tools and training necessary to teach the curriculum in their own communities. This seminar allows outstanding graduate students to explore questions central to the Created Equal Project. Nine students were accepted to the initial cohort in 2016, which included four distance learning sessions during the spring and culminated at the May 2016 conference on ethical leadership. The 2017 cohort of 13 students includes two in-person leadership seminars and three evening learning sessions. Learn more. Close to 20 women rabbis from across North America, representing all the major denominations, spent a week traveling throughout Israel in December 2016. Together they studied moral leadership and Jewish identity with Hartman scholars at the Shalom Hartman Institute in Jerusalem, and explored the many unique challenges and opportunities they face as female rabbis. Learn more. How Jewish ideas can inform the current discourse on power, privilege and sexual assault, including videos with Elana Stein Hain and members of the Created Equal Research team. Learn more. Arguing for the Sake of Heaven: A Vision For Modern Orthodoxy? Webinar with Elana Stein Hain in response to the discourse in the modern Orthodox community about female clergy. Learn more. Shalom Hartman Institute of North America Created Equal Research and Education Project was selected for inclusion in the Slingshot Guide to Jewish Innovation as one of the most inspiring and innovative Jewish organizations in the North American Jewish landscape today.